While Michael Nelson Jagamara and Imants Tillers have worked on panel paintings collaboratively since 2001, creating 24 works, Metafisica Australe 2017 holds special meaning: it reflects on the origins of their collaboration, which developed following Tillers’s use of elements of Jagamara’s Five Stories 1984 in his 1985 work titled The Nine Shots. His conscious copying of Jagamara’s cultural motifs is an example of the controversial practice of engaging with other artists’ imagery – a ‘postmodernist gesture’, typically done without the artist’s permission. However, while Tillers’s actions inspired an intense art-world debate, they also initiated a dialogue that became the foundation for a remarkable chapter in Australian art history and a 17 year friendship and collaboration, one that continues to flourish today. 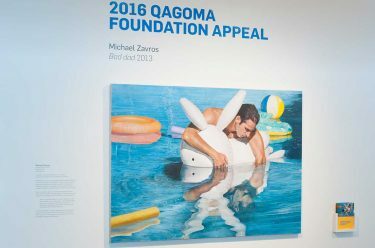 This year’s QAGOMA Foundation Appeal has as its focus both an incredible story, and a collaborative work of two internationally renowned Australian artists with a long association with each other and with QAGOMA. Metafisica Australe is the most recent creation resulting from this extraordinary collaboration. The central motif of this work, and a pivotal element in their ongoing collaborative conversations, is Jagamara’s landmark painting, Five Stories, which quickly became an icon of contemporary Indigenous art of the late 1980s. 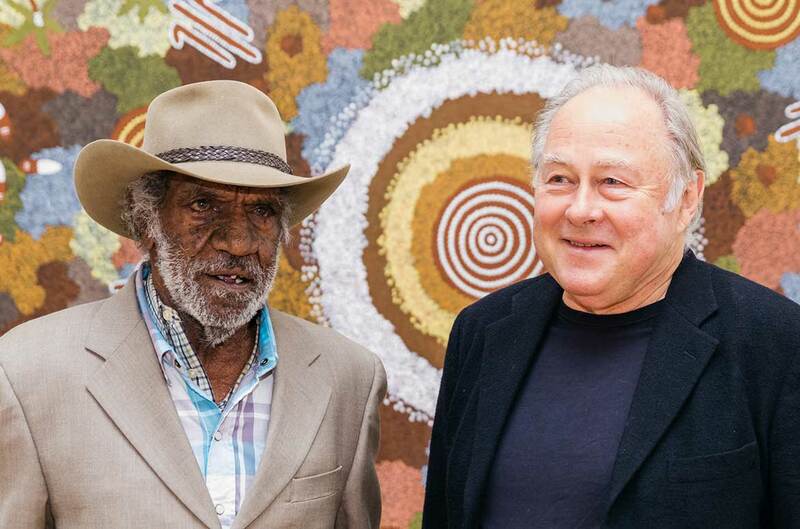 More recently, in 2016, the painting was sold at auction in England, where it established a record price for a work by a living Aboriginal artist. In March 2017, Jagamara painted a larger, more highly detailed version of Five Stories across 36 canvas boards. 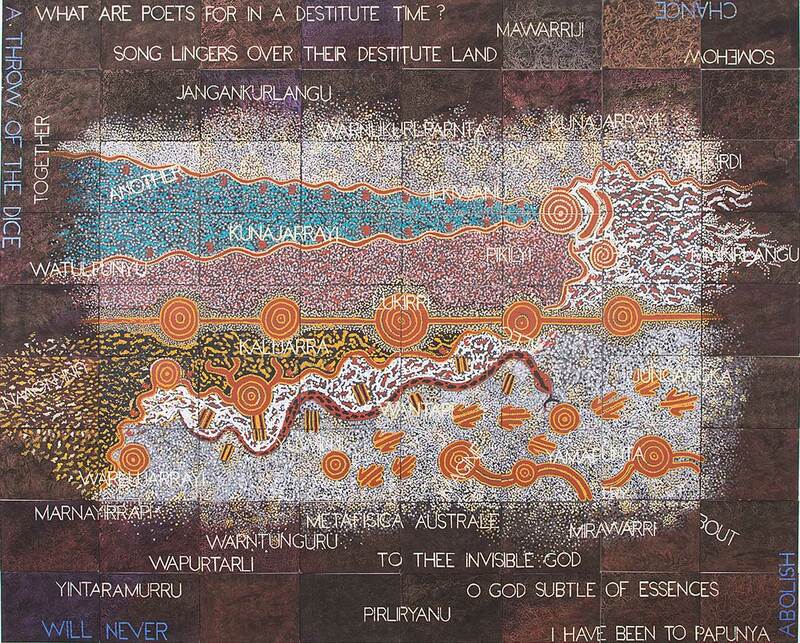 The following month, Tillers went to Papunya to visit Jagamara at his home, and later completed the collaborative work by adding a further 36 boards, which contain Warlpiri placenames and dreaming sites, and selected metaphysical and poetic references. Metafisica Australe is a rich, contemporary symbiosis of the personal, professional and cultural reflections of two great Australian artists. Listen to Michael Eather in conversation with Michael Nelson Jagamara and Imants Tillers as they expand on the incredible story which brought them together. You can now view Metafisica Australie at the Queensland Art Gallery during the 2018 QAGOMA Foundation Appeal. 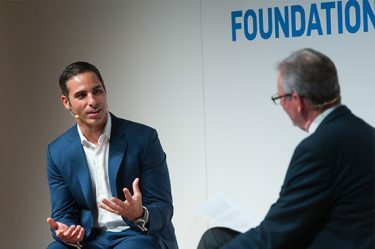 The 2018 Foundation Appeal will help QAGOMA to represent one of the most thought-provoking collaborative partnerships in Australia’s contemporary art landscape, and this compelling work will find a perfect home within the Queensland Art Gallery’s reimagined Australian collection display, where Indigenous and contemporary Australian collections, together with the Gallery’s historical holdings, tell a fuller story of Australian art. Previous Post« Previous How can art and science be used to imagine a shared future?